Since the dawn of history, the Moon has possessed an almost unequalled hold over the imagination of man, provoking by turns fascination and even worship. Mankind has studied the Moon for thousands of years, and some human depictions of its luminescent features may be over 5,000 years old. Alarmism is not our aim here at the Flat Earth Society, but the threat presented by contact with Lunar rays is significant, and the mainstream media has proven unwilling to alert the public to the evidence for and dangers of this hazard. Our only goal is to make sure that you and your loved ones remain safe. Any suggestions regarding additions or improvements should be posted in this topic. Among the earliest of cultures to recognise the power of Moonlight were Assyria and Babylonia, who considered it to have an notable effect on the fertility of women, though whether this was a positive or negative effect is unknown. Both Aristotle and the Roman historian Pliny the Elder are known to have associated the Moon with insanity, and as early as the 13th century, the term "lunatic" was in use, derived from the Latin word for Moon, "luna". It is probable that the word has earlier origins, perhaps going back to the original Roman-era Latin. The Romans even believed that Moonlight solidified to form the gem known as Moonstone. What's clear is that the Moon was clearly regarded as having the ability to affect terrestrial matter, and the association between the Lunar cycle and insanity was clearly established well over 2,000 years ago. Indeed, once the work of the Ancients was recovered in Western Europe, these observations quickly took on canonical status in Western medicine and psychology. The German-Swiss physician Paracelsus contended that mania was directly linked with the Lunar cycle, as did the English jurist Lord Blackstone, and the German psychologist Ewald Hering. Indeed, in the Bethlehem hospital in London, it was found necessary to chain and in some cases flog inmates in order to "prevent violence" during certain phases of the Lunar cycle1. Moonlight has also been associated with other strange effects and powers, most notably lycanthropy, the phenomena whereby a human possesses the ability to turn into a wolf, or transform into a Werewolf, a creature that shares the characteristics of wolf and man. Werewolves and their capacity to transform were "often associated with the appearance of the full moon", so that "it was said that a man or woman could turn into a werewolf if he or she . . . slept outside on a summer night with the full moon shining directly on his face". Furthermore, "[i]n some cultures, individuals born during a new moon or suffering from epilepsy were considered likely to be werewolves". Although the existence of Werewolves is the subject of dispute, it represents an ancient, cross-cultural association between Moonlight, abnormality, danger and derangement, one that persists to this very day, " class="bbc_link" target="_blank">as can be seen in Neil Jordan's The Company of Wolves. It is therefore apparent that throughout much of recent human history, enlightened thinkers and medical experts and ancient cultures have identified the Moon's power to affect man's cogitation, and to distort and warp his ability to reason when under the influence of its beams. 1. Oliven J. Moonlight and nervous disorders. Am J Psychiatry 1943;99:579-84. The question of the Moon's capacity to harm or endanger humans was largely ignored by scientists during the late 19th century and for much of the 20th century, no doubt due to their belief that the Moon was a dead world that merely reflected the light of the Sun. The general public's increasing ignorance was perhaps as a result of increased electrification, and a resulting decrease in awareness with respect to the all-pervasive nature of the Moon's rays, which no doubt would have been more obvious prior to the advent of continuous street-lighting and reliable portable illumination #t=3m31s" class="bbc_link" target="_blank">such as flashlights. Nevertheless, the experiences of sensitive professions forced scientists to examine the Moon's capacity to affect human behaviour. The resulting research has provoked considerable debate within the scientific community, with many scientists affirming the Moon's power, and others contesting their results. However, given the methodological flaws of the scientific method, such dispute is far from surprising. In contrast, since the creation of the Zetetic Method, its followers have had no doubt as to the power of the Moon and the dangers presented by Moonlight. In his seminal treatise, Zetetic Astronomy: Earth Not a Globe, Dr Samuel Birley Rowbotham determined not only that the Moon's rays are of a different and independent composition to those of the Sun, but also that exposure to its rays can prove most injurious, resulting in the spoiling of food such that it is dangerous to eat, and that it can even cause blindness if direct exposure to its rays is prolonged. The Moon's capacity to damage terrestrial flora (which is exposed to Moonlight more often and more regularly than most humans) has been established not only by Zetetics in the 19th century, but also by contemporary researchers. Moreover, a number of Zetetics have observed a variety of detrimental health effects under its influence, such that within the Zetetic community there is a broad consensus regarding the Moon's capacity to harm biological lifeforms with its bioluminescent rays. Of course, the natural response when presented with such compelling evidence is to ask how one can avoid the risks posed by Lunar rays. Unfortunately, the Moon is an almost ever-present feature of our lives, and it emits its injurious beams for a considerable period almost every twenty-four hours. The most important step, therefore, is to be aware of when such emissions are most likely to take place. Thankfully the Moon's emanations are regular, and therefore with sufficient research can be predicted, so that one can take steps to avoid it when it is most dangerous. Depending on your location, the apparent state of the Lunar cycle may vary, so we advise that you conduct independent, Zetetically rigorous research, preferably through remote means such as video cameras or specialized means of filtrating and projecting its light. You will soon record a cycle lasting approximately nine and-a-half days, punctuated by varying but regular degrees of Lunar emissions. As the above research indicates that the harmful effects of the Moon correspond with the quantity of Moonlight to which one is exposed, the Full Moon is obviously particularly dangerous, as indeed are the Waxing and Waning Gibbous. Exposure to Moonlight during these periods should be kept to a bare minimum, and ideally should be limited to situations where contact is either necessary or unavoidable. The Waxing and Waning Crescent are obviously less dangerous, but nevertheless it is advised that one should not be foolhardy, as the limited amount of light produced by the Moon during these periods will be more than offset by any extensive exposure. Wear sunglasses - Dark glasses may protect your eyes, which are particularly sensitive, from Moon rays which can damage your eyes. Cover any exposed skin - Cases of Moonlight exposure to bare skin can be particularly severe. Always wear long sleeves, gloves and a hat. A balaclava or thick scarf can protect your nose, mouth, cheeks and ears from the Moon. 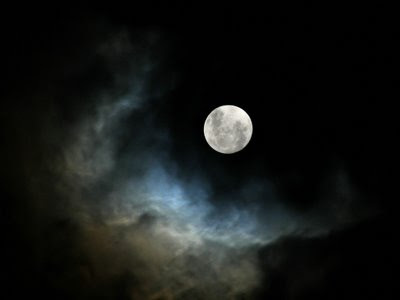 Protect your home - Moonlight can seep in through uncovered windows, doors and skylights. Make sure that you have thick curtains, or, better still, shutters on major windows which are likely to face the Moon. You may find it useful to tape reflective material, such as aluminium foil (shiny side out) on gaps in your home, or even on the windows themselves, in order to improve Moon-protection further. Make sure your pets are safe - The Moon can hurt animals just as much as humans. Consider bringing your pets indoors during the evening, or if you intend to let them roam the night, you may want to wrap them up in protective clothing just as you did with yourself! Watch out for plants - Moonlight can putrefy many varieties of unsuspecting garden plant. Most flowers close their petals at night in order to protect them from Moon rays, but during the Super-harvest Moon this may not be enough. You may want to cover even self-defending flowers and other plants with aluminium foil or another protective material. Several days worth of clean water, uncontaminated by Lunar rays. Filling spare bottles, baths and sinks before hand is a useful strategy. Proteinous tinned food and vegetables, along with any other non-perishables. A portable gas stove with plenty of spare gas cannisters. An emergency heat source, and sufficient blankets and other insulative materials. At least two high-quality flashlights, with plenty of spare batteries. If disaster strikes, you may be without electricity, and (for obvious reasons) you will be unable to navigate by Moonlight - indeed you should be sealed off in complete darkness. Make sure to have several high-quality flashlights that will run efficiently and reliably. At least one multi-tool, and ideally a decent knife and perhaps a folding saw and hatchet. Depending on the situation, it may be advisable to stock several firearms and plenty of ammunition, depending on local laws. Natural disasters often bring out the worst in some people, and under the deleterious influence of a Super (Harvest) Moon it could be even worse. Do not seek violence, but be prepared to defend you and your family from the exposed. So that our members are aware of such crises, we will endeavour to keep an updated list of immanent Super Moon events, detailing the date, duration and (when possible) intensity of these spikes in Lunar activity. Ancient cultures across the world and throughout history have given names to the first Full Moon of a given month, and following the wisdom of the ancients, I consider this a useful way to categorise and refer to Lunar phenomena. However, as a host of different names exist, I felt it would be wise to create a Zetetic Lunar Calendar, choosing 12 names from among the various appellative Lunar traditions. This provides us with a common vocabulary with which to discuss Lunar events. These names will be also be used in the Lunar Forecast below. Outlook: 15 - 30% brighter than average. Moderate to high-intensity (provisional). Outlook: 16-30% brighter than average. Moderate to high intensity. Credit goes to Space Cowgirl for the heads-up. Outlook: 30% brighter. High intensity. Advice: Seek shelter and take all possible precautions. Moonlight burns were just mentioned on ABC's primetime show: Sharktank. These millionaires and billionaires know the truth. Too bad they'd rather make money than warn more people. O'Leary started a software company in the basement of a small Toronto home along with partners John Freeman and Gary Babcock. His mother provided the seed investment of $10,000, which he used to start software publisher SoftKey. Softkey products typically consisted of software intended for home audiences, especially compilation discs containing various freeware or shareware game software packaged in a "jewel-case" CD-ROM. By 1994, Softkey had become a major consolidator in the educational software market, acquiring no less than sixty rivals, such as WordStar and Spinnaker Software. In 1995, Softkey acquired The Learning Company (TLC) for $606 million, moved its headquarters to Boston, and took The Learning Company as its name. TLC bought its former rival Brøderbund in June 1998 for $416 million. In 1999, The Learning Company and its 467 software titles were acquired by Mattel in a $3.8 billion stock swap. Sales and earnings for Mattel soon dropped, and O'Leary departed from Mattel. The purchase by Mattel was later called one of the most disastrous acquisitions in history. In 2003 he became co-investor and a director in Storage Now, a developer of climate controlled storage facilities. Through a series of development projects and acquisitions, Storage Now became Canada’s third largest owner/operator of storage services with facilities located in eleven cities serving such companies as Merck and Pfizer when it was acquired by the In Storage REIT in March 2007 for $110 million. In March 2007 O'Leary joined the advisory board of Genstar Capital, a private equity firm that focuses on investments in selected segments of life science and healthcare services, industrial technology, business services and software. Genstar Capital appointed O'Leary to its Strategic Advisory Board to seek new investment opportunities for its $1.2 billion fund. O’Leary also serves on the executive board of the Richard Ivey School of Business at The University of Western Ontario. He is a member of the investment committee of Boston’s 107 year old Hamilton Trust and an investor of EnGlobe, a TSX listed company. He is a former co-host of SqueezePlay on Business News Network, Canada’s national business television specialty channel. O’Leary is currently working as the entrepreneur/investor co-host for the Discovery Channel’s Discovery Project Earth, a project that explores innovative ways man could reverse climate change. O'Leary serves as foil to Journalist Amanda Lang on The Lang and O'Leary Exchange on CBC News Network. He is also a venture capitalist on the Canadian version of Dragons' Den and host of Redemption Inc. which both air on CBC Television, and a "shark" on the United States' version of Dragons' Den, Shark Tank, which airs on ABC. In January 2008 he co-founded O'Leary Funds Inc., a mutual fund company that targets buy and hold investors. He is the company's chairman. I saw a slight haze in the hotel bathroom this morning after I took a shower, have I discovered a new planet? Yes it is sad that a very small percentage of humans have a recessive anti-moonlight gene. I think we should start a FES Telethon to raise money for these poor people. Is there any new Super-Moon event for this year? I found this lunar calendar to be inspiring. I have been doing (reading and watching videos) some courses around Internet related to Astrology and I found this post to be linked in some sort to the names given to the moon. I will bring the names and the relation of the zodiac symbols to their respective moon´s name. And this is a sticky? WTF has this got to do with a flat earth? Or is it a case of who you know? The video demonstrates that we can not fully trust our senses. Updateded the Lunar Forcast to warn of pending Super Moon event in May. Consequently, this will be a Super Milk Moon. The lunar event on the 25 of May, even despite it is told to be of "0,01" magnitude, almost visually imperceptible, is it still dangerous? Ladies and gentlemen, he'll be here all week, be sure to tip your waitresses and bartenders. Nope. He's on tour right now, so check the schedule for future dates. Updated to draw intention to an intense summer of lunar activity. A Super Hot Moon and a Super Mead Moon will follow May's Super Milk Moon in June and July respectively. Silence, naysayer. This is a very real danger and dammit I will not have you jeer at it. I only suggest those that are affected do something to prevent it. If you are not affected, as I, there is no worries. Why is this not in CN? It has nothing to do with anything. Can I start a post about the supernatural powers of Goji juice in FE general? Jason, you are my least favorite noob. The power of the moon has always been a large part of the society, right back to the days of Samuel Rowbotham. There is nothing about Goji juice, however. I agree, this should remain here for those unfortunate to have the recessive moonlight gene. Read Earth Not a Globe. This section was linked to in my original post, had you taken the time to read it. We get it, okay? You're not affected by moonlight. You don't need to keep on telling us this. 99.9% or more of the worlds population are not affected. But to those that are, take measures. Is the percentage of affected people higher among individuals who believe in a flat earth? Everything else is a fairy tale! Yes, it's called the planebo effect. Ok so if I provide a link demonstrating that Rowbotham drank Goji juice I could then start a post on it in FE General, right? Go for it. But if it's rubbish (i.e. a lack of clear textual links to the FES) I'll just move it. This board is for discussion about the Flat Earth Society or the Flat Earth movement in general. For example, if you want to ask questions about The Conspiracy, flat earth believers and their beliefs, or anything else not related to Flat Earth Theory, this is the place for it. This topic is precisely the kind of subject matter intended to be posted in this board.